September 2016 - fancy a swap? September school holidays are almost here so let's go boating with the kids or grandkids. My family was boating on the outside of Bribie Island last Sunday and there were so many humpback whales that you could almost walk to Moreton Island! Are you into marina swapping? Boats at Scarborough Marina (well, at least those without masts) have been invited to spend the same weekend at Spinnaker Sound and enjoy a meal at Italia on Marina or the Oyster Festival at Sandstone Point Hotel. Please make them feel welcome. Scarborough Marina is about 9 nautical miles away. We plan to depart about 11am if you want to tag along. Our marina fees will rise by 5% from 1 January 2017. This is due to our significantly increased government and utility costs, and is only our second price increase since 2010. To delay the fee increase, customers may pay up to 12 months in advance prior to year-end. Consistent with other marinas, we have also introduced a 50% surcharge upon wide-beam vessels (> 4.5 meters) due to the larger space requirements. The Spinnaker Sound research & development team recently visited New Caledonia (and each of its marinas), including the spectacular Isle of Pines (photo below). The characterful capital Noumea is the closest overseas destination from Brisbane, being only two hours flight. The lagoon which encircles New Caledonia is the world's largest coral lagoon and a magic destination for boating with protected waters, steady trade winds and secluded destinations. Yes, we're talking tropical weather, crystal clear waters and fine French cuisine! Did I mention the French food? Unbelievably, it's almost that time of year again. Save the date for the Spinnaker Sound Christmas party.... SUNDAY 4TH DECEMBER from midday. The next Volunteer Marine Rescue Bribie Island seminar entitled Basic Navigation is on Sunday 9 October from 2pm to 5pm. These seminars are extremely useful, especially for those who are new to boating or new to our area. Bookings are essential - phone 3408 7596. On 13 November, the seminar is Small Boat Engines & Maintenance. Well that's all for now. Don't forget to save the date for our Christmas party - Sunday 4 December. Today certainly feels like winter has arrived. So let's embrace the cold with roast turkey, cranberry sauce and mulled wine. Spinnaker Sound and IC Frith invite you to join us for "Christmas In July" on MONDAY 25 JULY @ 6 - 9pm. Our good friends Sean & Korina from IC Frith insurance advisers will be hosting a winter-warmer dinner at Italia On Marina and drinks will be available at the bar. Please RSVP to info@spinnakersoundmarina.com.au by 20 July. Numbers are limited. We knew that the Sandstone Point Hotel was popular, but it appears that Sandstone Point (or rather Spinnaker Drive) is Queensland's new growth corridor. Civil work has now commenced on the 122 house Orianna development on the opposite side of Spinnaker Drive (see www.orianna.com.au). But more relevant to marina customers, development approval has recently been granted for 168 units adjacent to the marina; that is, the vacant lot between the marina building and Spinnaker Seafood. The project will likely enhance the vibrancy and amenity of the marina and surrounds. Amongst other things, the waterfront area will be landscaped and the boardwalk extended. However, the development will in due course impact upon marina parking. I will keep you updated. Our inaugural boating seminar "Pizza & Port; Starboard & Sauvignon Blanc" was held in mid-June and was very well received by attendees (and not just because of the free wood-fired pizzas). We heard invaluable advice from Volunteer Marine Rescue's Gary Voss & Alan Trantor about practical subjects such as navigation in the Pumicestone Passage and the best routes to Moreton Island. See www.vmrbribie.com.au for more details. It's only day one of the school holidays and if like mine, your next gen are already going crazy, there's a few activities in and around the marina to consider. Talk to Brendon & Robyn from Bribie Island Boat Charters about hiring a BBQ or fishing boat to show the kids around the passage or to land a flathead for dinner (www.bribieboats.com.au). Our dive shop - Absolute Scuba - is also offering dive and snorkeling excursions throughout the holidays to the magnificent Flinders and Curtin reefs (tel: 5497 7543). The Absolute Scuba team has also opened a cafe at the marina which is open seven days. As well as enjoying coffee by the water, you can pick up your Healthy Farms Milk and other essential items. The team has a couple of kayaks available (a no cost) to splash around the marina, but please wear a lifejacket. Please welcome Austin Lethaby to the Spinnaker Sound team. Austin's considerable energies will be applied to maintenance activities around the marina. He has already been sighted power washing the entire pontoon structure. Have a great week ahead! Remember to RSVP for our Christmas In July function. The Spinnaker Sound team has grown. With the sad departure of Joel, our team has been boosted with the addition of Fiona and Luke. Fiona is the friendly face of the marina on Thursdays & Fridays and will be helping out with some exciting new projects. uke has just joined us as an Operations Assistant. He's a demon on Fred The Forklift and will be taking care of you on weekends. Hip hip hooray. For the first time in a couple of decades, the marina entrance and fairways are now 2+ meters deep (LAT). Many thanks to the excellent chaps from East Coast Maritime and the mighty tug Lismore which spent a couple of weeks levelling the marina basin. We have a selection of recovered items in the office if you've lost your anchor, shopping trolley, crab pot, pacemaker, fishing gear or propellor. The Spinnaker Sound team wishes you all a relaxing, fun, enjoyable, possibly inebriated and safe Easter! The marina will be open throughout the Easter holiday. Well the busy festive season is upon us again and we're in the Christmas spirit! First things first. Come and celebrate another nautical year at the Spinnaker Sound Christmas party - this Sunday 13th from midday at our Italia on Marina restaurant. Enjoy live music from What The Funk, a jumping castle for the kids / grand-kids and maybe a visit from Santa? We'll be shouting the pizzas; BYO drinks or $5 beer & wine at the bar. We will be open throughout the Christmas and New Year period, with the exception of Christmas Day and New Years Day. For our dry storage customers, please let us know in advance if you would like to use your boat on these days. We are very pleased to welcome Fiona to the Spinnaker Sound team. Previously working at the University of Queensland, Fiona is now enjoying sea views from the marina office on Thursdays and Fridays. Our lovely Leonie remains the friendly face of the marina Mondays through Wednesdays. Spinnaker Sound's restaurant is now Italia On Marina and is under new ownership and management. Fortunately the wood-fired Slammer, Whip Cracker and Diabolus Viper are still on the menu (and can be delivered to your berth), but you can now also enjoy the Local Garlic Prawns, Duck Ragu, Pollo Alla Romana and more. Italia On Marina is open 7 days for lunch and dinner (and marina Christmas parties). Let the team know you're a marina customer and they'll look after you. Snorkel Safari, also under new ownership and management, will very soon be opening a shop next to the restaurant which sells dive / snorkelling tours & equipment (including gear hire & tank refills), chandlery, convenience goods, coffee and more. If you're a marina regular, let Peter and the team know what you'ld like to see stocked. Our final marina business under new ownership and management - IC Frith insurance - is now open Monday to Friday. Sean and Korina will be delighted to arrange competitive cover for your vessel upon your next renewal. Call 0439 828 089. Our shower & toilet facilities have now been renovated. A big thanks to Rob & the team for your efforts. If you borrowed the new monsoon shower head, please bring it back as our customers quite like it. Thanks to the fragmentation of OPEC, fuel is at the lowest prices in years. It's a good time to fill up your thirsty cruiser. We have had a couple of cancellations for pre-Christmas antifouls & detailing. Talk to Ben (5497 5511) if you would like your boat looking its best for Santa's arrival. I took my 8 year old son snorkelling at Flinders Reef last weekend and can highly recommend it for those who haven't visited. Located about 3nm north of Cape Moreton, Flinders Reef is Brisbane's closest true coral reef and is a real gem! There's an abundance of corals and sea life, including rays and giant turtles. Flinders is quite exposed, so look for a calm weather window. There's a number of public moorings available. OK, so it's not particularly relevant to the marina, but if you're looking for exciting 2016 holiday ideas, I can strongly recommend hiring a houseboat on the Backwaters of Kerala, India. The houseboats are simply amazing - handcrafted from local woods and fibre - and you enjoy facinating scenery along 100s of kilometers of canals while your personal cook prepares delicious South Indian food. That's all from Spinnaker Sound. We'll see you for a celebratory bevvy at the Christmas Party on Sunday. It's all new at Spinnaker Sound. The last 20 months have been about renewal - new branding, new pontoons, new pedestals, new forklift, new team members, new signage, new customers, new restaurant, new boardwalk, new philosophy and all of that. OK, there's still quite a bit of old stuff, but let's overlook that for now. There's been changes in the Spinnaker Sound team. Clan Corrie is establishing a Spinnaker Sound dynasty, with Joel Corrie joining his father Rob within the Operations & Maintenance team. Eager to take it up to his dad, Joel is equally adept at driving a forklift, a boat and a computer, and will be a regular on weekends. Welcome Joel! Travis Murray has donned the white collar - congratulations Travis - but will remain with us on a casual basis. fter many years with Spinnaker Sound, Denise Perkins has left us to pursue other opportunities. I sincerely thank Denise for her service to the marina. Leonie Ethell, who has been with us since late last year, will assume Denise's responsibilities. Leonie's email is info@spinnakersoundmarina.com.au (although Denise's email will remain operational). The 1 to 172 wet berth numbering system (hang on, we only have 150 berths?) has been retired and replaced with a more logical and navigable system. Our rows are now numbered A (Bribie Island Road end) through H (marina entrance end) with berth numbers ascending outwards along the marina walkways. The new berth numbers have been marked on the finger ends. Finally, we are in the process of installing flash new marina management software which will, amongst other things, improve our administration and customer service. But alas, given the quantity of old data to migrate to the new systems and my general poor aptitude for IT, there is a transitionary period which may result in invoices and other communications being delayed. We apologise for any inconvenience. OK, so the festive season is officially over and it's back to work. But the good news is that the sublime late summer / autumn boating season is upon us. Being 2015 - the (unofficial) "Year of Boating" - make sure you skew your priorities from 'work' to 'life' and we'll see you on the water. Yes, they're baaaack! It's only three sleeps until the next Friendly Friday..... a (very) casual get together of marina residents, customers and friends... Meet at Kalmakuta Park (on the other side of the marina basin) from 5.30pm this Friday and every second Friday thereafter. There's a playground for the kids and BBQ facilities available. The splendid folk at Bribie Island Boat Charters provide a chauffered BBQ boat transfer service between Kalmakuta Park and your boat, the boat hire office or the fuel dock. BYO everything. Come and join the Spinnaker Sound community to celebrate the end of the week. pinnaker Sound's operating hours are 7am - 5pm on weekends and 8am - 5pm on weekends. To preserve our hard working team's marriage prospects, please remember that the fuel dock and gates close at 5pm, so please allow enough time for your boat to be lifted, washed and unpacked prior to this time. I'm very pleased to welcome the team from Snorkel Safari to Spinnaker Sound Marina. Snorkel Safari are offering diving and snorkelling instruction and tours to the world-class Flinders Reef aboard their 12 meter dive boat Nemo. Check out www.brisbanediving.com for more information or call 07 3368 3766. Hats off to the House of Saud, the Texas fraccers, the free market.... or whoever's pulling the strings, but at $1.40/litre currently, it's the best time in years to be filling the diesel tanks. Our fuel dock is open 7 days from 7am - 5pm weekends and 8am - 5pm weekdays. The Spinnaker Sound community is rebuilding strongly and I'm thrilled to see so many families, new and old, at the marina on the weekends. My own sons had a ball kayaking, swimming and meeting new friends last weekend. And speaking of The Urban Vine, our new Italian restaurant is open 7 days for lunch and dinner. I've pretty much worked through the menu myself, and can highly recommend the Supressor wood-fired pizza... or a Viper if you're feeling punchy. 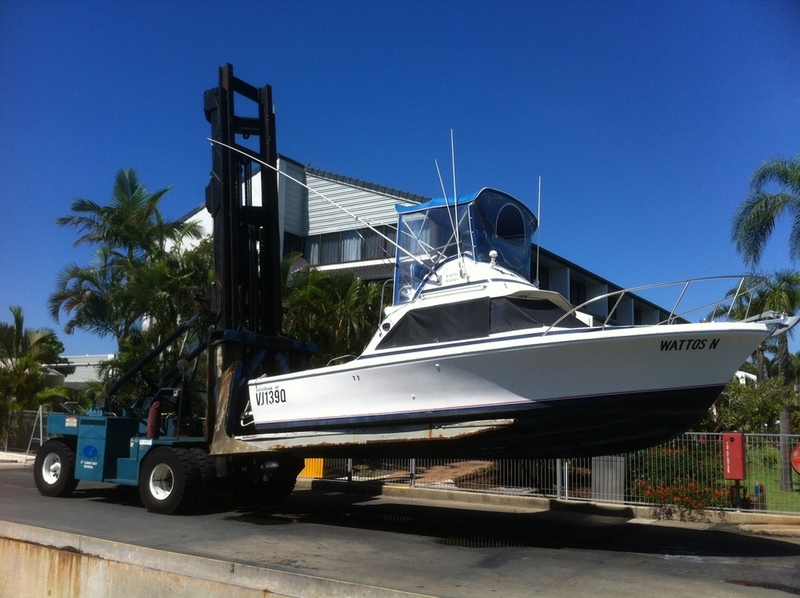 Catherine and the team will even deliver to your boat! Call 07 5497 7786 for bookings. Our workyard services have now expanded to include soda blasting. Treat your boat to the ultimate facial! Please talk to Ben to discuss blasting, antifouls, detailing, fibreglass works or your other boating needs. And finally, finally... B&Y Waste Services now offer a $70 sewerage pump-out service from Spinnaker Sound. Call 07 5496 6988 for bookings. Have a great week. See you for Friendly Friday from 5.30pm! It has been a year since the relaunch of the 'new' Spinnaker Sound Marina. I would like to use this opportunity to warmly thank all of our customers for the support that we have received over this time. The process of reinvigorating Spinnaker Sound is ongoing, but I am pleased with progress. Amongst other things, our terrific team has refurbished a significant proportion of the marina and dry-stack structures, improved the scope and quality of marine / work yard services and enhanced the general appearance and 'feel' of the marina. And there's much to do! Some of you would have seen that boardwalk construction is underway, and a number of other projects are planned. Your ideas and suggestions for the 'to do' list are always welcome. The opening of our new Italian restaurant, which shouldn't be too far away (fingers crossed), will be a great catalyst for marina staff and our fellow boaters to get together on a regular basis for a wood fired pizza, beverage and a banter. - Spinnaker Seafoods has undergone a significant renovation, and is an even better venue for a casual lunch! Please welcome new operator Robert Ramsey. - We still have a couple of retail spaces available for lease, so please consider any appropriate businesses or leads (my wife has requested a day-spa). - Super-talented artist Norm Thorley is currently displaying a number of his works in the marina office. Come and have a look. And don't forget to tell your boating friends about the 'new' Spinnaker Sound. The marina is going to get better and better! Please note that Spinnaker Sound Marina (including the fuel dock) will be closed on Christmas Day and New Years Day. We would be pleased to launch dry stack boats on the previous day. Have a happy and safe Christmas! Join the team from Spinnaker Sound Marina for our Christmas lunch on Sunday 8 December. The venue is Spinnaker Seafoods, and we'll be kicking off from midday. Bring the kids as we may have a special guest. We'll also be holding a charity auction (bring your cheque book!) for the benefit of Bribie Island Volunteer Marine Rescue, Night Eyes Water and Landcare and the Bribie Island Game Fishing Club... with auctioneer extraordinaire David Mason-Cox. Please let us know if you or your business have any great auction items to donate. Friends of Spinnaker Sound Marina. Our next get together is on Friday 15th November. Come and enjoy a BBQ prepared by our buddies at Bribie Island Game Fishing Club, have a drink and enjoy the company of the Spinnaker Sound staff and community.